Orange temporary fencing and white temporary barriers known as K-rails signal the start of Express Lane construction along southbound I-680 in Contra Costa County. Just as orange poppies and trees with bursts of white blossoms herald the advent of spring in the Bay Area, the sudden appearance of orange fencing and white K-rails signals the start of improvements along the region's freeways; and there are unmistakable signs of a new construction season taking shape along southbound Interstate 680 from Martinez to Walnut Creek as crews this month moved into high gear to add 11 more miles to the Bay Area's growing network of Express Lanes. These are lanes that are free for carpools, buses, motorcycles and other eligible vehicles — but also open to solo motorists who choose to pay a toll to take advantage of any unused capacity in the lanes. All tolls are paid electronically via FasTrak. 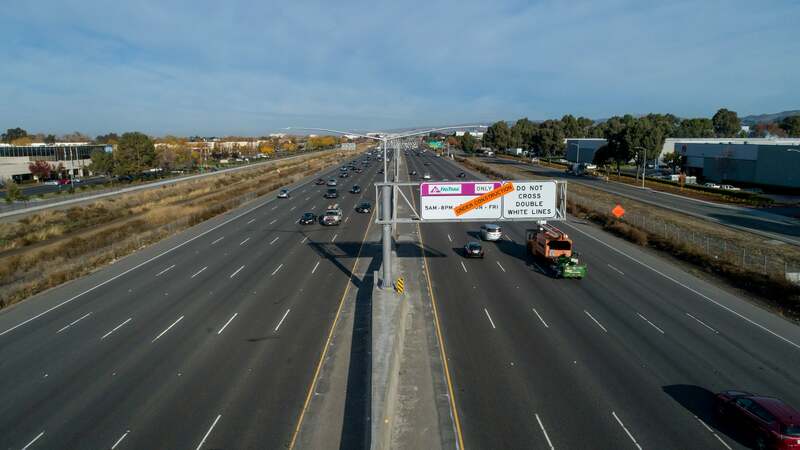 Expected to open to traffic in 2021, the new southbound I-680 Express Lane will connect with MTC’s existing Express Lane between Walnut Creek and San Ramon – providing 24 miles of continuous Express Lane in Contra Costa County from Martinez to the Alameda County line. Project plans include converting the existing carpool lane from just south of Marina Vista Avenue in Martinez to North Main Street in Walnut Creek, and then adding a new southbound lane from North Main Street to Rudgear Road. Project partners include MTC, Caltrans and the Contra Costa Transportation Authority. Crews are working to wrap up the installation of electrical infrastructure that will power the toll system and overhead signs on northbound I-880. Elsewhere in the East Bay, workers this month reached roughly the halfway point on the project begun in September 2017 to convert to Express Lanes the existing carpool lanes along both directions of Interstate 880 between Fremont and Oakland. Crews are working now to finish paving and striping work associated with recently-completed widening of northbound I-880 at the CHP truck scales in Fremont, and to wrap up the installation of electrical infrastructure that will power the toll system and overhead signs. Remaining segments for electrical work include the stretches from Decoto Road/Highway 84 in Fremont to Highway 92 in Hayward and from Highway 92 to Hegenberger Road in Oakland. Work near the Hacienda Avenue overcrossing to improve drainage and to widen and repave southbound I-880 will occur intermittently through December. 50 percent completion of new drainage improvements near the Hacienda Avenue overcrossing.